This is one of the best soup recipes I’ve made in a while and I absolutely couldn’t wait to share it with you. 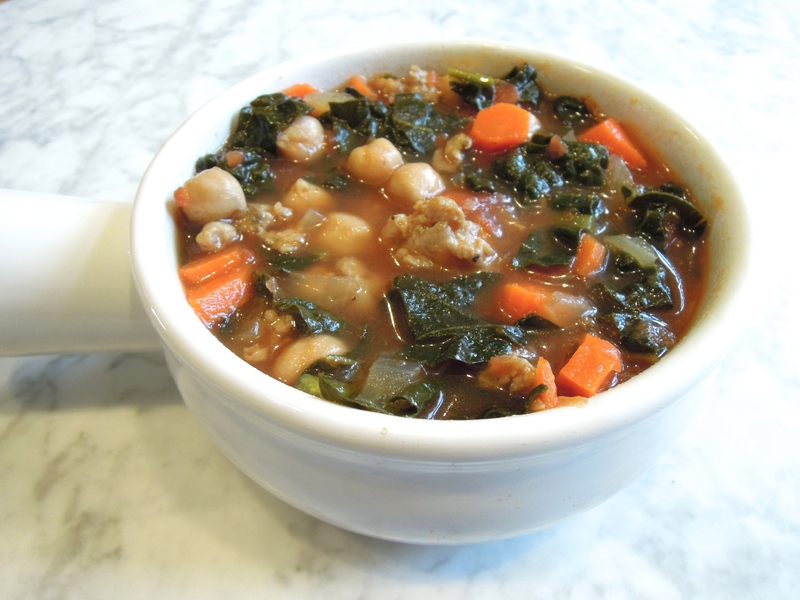 I hesitated for a moment because I already have a few similar soups that offer some combination of sausage and veggies on my site like chicken sausage vegetable soup and sausage sweet potato soup (and I highly recommend them all!) But when you live somewhere cold like Chicago, you can’t have too many soup recipes up your sleeve. You just can’t. Plus, soup is such a great way to pile in lean protein and a heap of veggies so I always feel good about it. In this bowl of goodness, you’re looking at some lightly browned chicken sausage, chickpeas, lacinato kale, and tomatoes. There are also carrots, onions, and lots of garlic. It’s a winning combination. Take my advice and serve this soup with some really yummy crusty bread. I don’t know what took me so long, but I normally don’t serve bread with soup. Now there’s no going back. I was in Costco recently eyeing the freshly baked multigrain loaves (they were still warm!) when another shopper talked me into it. She said she knew the exact day and time to arrive when they’re fresh and that they freeze beautifully (because of course you get two ginormous loaves.) She didn’t steer me wrong and I promise you’ll experience a whole new level of comfort when you serve some warm bread alongside your soup, too. *In order to avoid BPA, I’ve eliminated cans from our house as much as possible. Instead, I use organic tomatoes and beans in boxes. The sizes aren’t exactly the same as standard can sizes listed here (boxed beans tend to be 13.4 oz and boxed tomatoes are 26 oz), but the boxed sizes work just as well and you don’t need to make any adjustments. If you’re looking to switch from cans to boxes, you can find them at Whole Foods and Target. Heat olive oil in a soup pot over medium-high heat. Add sausage and cook until lightly browned, about 5 minutes. It doesn’t need to be cooked through. Break up large sections with a wooden spoon. Once lightly browned, remove sausage to a bowl and set aside. You may have enough fat from the sausage to cook the veggies in, but if the sausage is super lean you may want to add about 1 Tbsp olive oil to the pot. Add onions and carrots. Sautee until softened, about 8 minutes. Add garlic and stir just until fragrant, about 30 to 60 seconds. To the pot, add chicken broth, tomatoes, and oregano. Increase heat to high, bring to a boil, and then lower to a simmer. Simmer, uncovered, for 15 to 20 minutes. 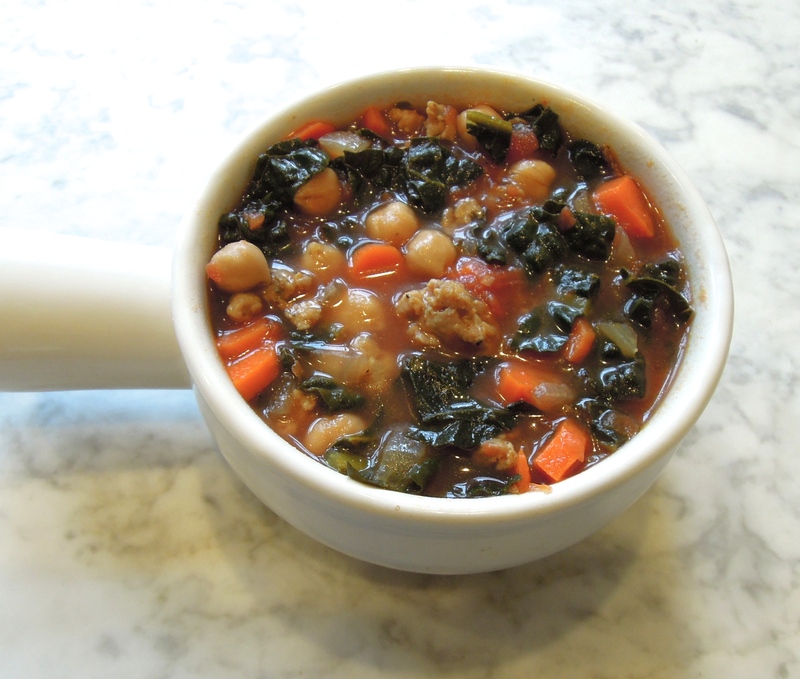 Add sausage, chickpeas, and kale to the pot. Cook for another 10 minutes until kale is wilted. Season with salt and pepper to taste. Ladle into bowls. Top soup with grated parmesan, if desired. Serve with crusty bread. This entry was posted in Soup on January 23, 2015 by Paige Greenfield. Made this tonight. Soooo good, perfect for a cold winter’s night — and love that we could use pantry items on hand. Thank you! Hi Eva! I’m so happy you enjoyed it!!! It’s one of my favorites – definitely making it again soon. Stay warm!